Rest in peace, Chef Trotter. Having a dinner (complete with wine pairings) at Charlie Trotter’s place in Chicago was one of my earliest adventures in fine dining. It must have been 15 years ago…I lucked into a short business trip to Chicago and by some miracle was able to get a late-night reservation for 2 at Trotter’s. I didn’t know anyone in Chicago (or on the trip with me) so one of my best friends drove over 300 miles just to have that dinner with me (he drove home that same night, while I headed to the airport). You know who you are…and thanks! True to Chef Trotter’s form, it was an amazing dinner (well worth the money) and was followed up by a tour of the kitchen, a chance to meet the Chef and his staff, and a walk through the wine cellar! I am not sure, but it seemed to me at the time that all customers were given the same end-of-meal treatment. True hospitality. Chef Trotter will continue to inspire me to reach for excellence in all things. 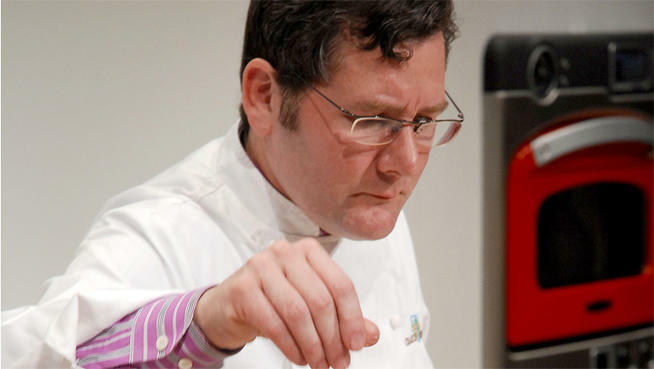 I always recommend the book Lessons in Service from Charlie Trotter to my managers, staff, and chefs as a reminder that, just like an impossible wine pairing or a deep yoga pose, there’s forever room to push harder to improve and innovate. What a beautiful comment! I had forgotten about Chef Trotter’s books…he was a wonderful writer on service and excellence!! I’m going to go dig his books out of the bookshelf now! Cheers, Jane N.
He was one of my favorite chefs as well. A real trail-blazer. He served tasting menus (even vegetarian) before tasting menus were cool. Thanks for the tribute. I watched the video and love it. Thank you for this beautiful tribute to one of the most talented chefs of this generation. He will be sorely missed by so many. And thank you for the video, a gift to all of us. Thanks, Barbara! I have been watching that video for years, and it still inspires me! Chef Trotter was a trail blazer, and one of my personal heroes! Thanks for reading!